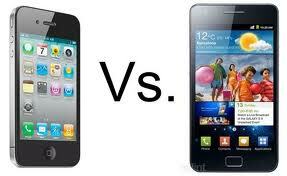 Comparaison des meilleurs smartphones du moment: L’iPhone d’Apple 4S contre le Samsung Galaxy S2. Découvrez où ira votre argent! This article was posted in Smartphones and tagged apple, galaxy, iphone, samsung. Bookmark the permalink. Follow comments with the RSS feed for this post. Post a Comment or leave a trackback: Trackback URL. One Response to "iPhone 4S ou Galaxy S2"